Nainital is one of the most beautiful and heavenly district, located in the Himalayan range in the state, Uttarakhand. It is splendidly situated at an altitude of 1938 meters above from the sea level, and it is also known as the “Lake city of Uttarakhand”. The oldest city of the state Uttarakhand, Nainital has been consecrated over the figure of goddess Naina Devi, and the Naina Lake that embraces the city with its magnificent aura. The urban, but not so populated city is surrounded by a number of beautiful lakes and splendid mountain ranges, like Deopatha and Aryapatha, which carries the Kumauni heritage and culture blissfully. The city is structurally separated into two distinct parts by the Lake, Naini. The first part of the city is Mallital that is the Northern part, while Tallital is the Southern part. The temperature of the city remains ambient and pleasant, which is far exuberant to visit while winters. During summers, the temperature toggle around 27 degrees Celsius, and if you are lucky then you can see the beautiful clouds and rains. However, in the winters, the temperature can be bone chilling, but still highly desired to witness the snow fall. Thus, the city is the most wanted holiday destinations for newlywed couples, families and travel enthusiast to spend their holiday and pop out a new aliveness in the blissful aura of the Mother Nature. In between the seven mountains touching the zenith of the sky, the Lake is well located in its spellbound beauty, and its deep blue and pristine water. It presents a number of opportunities for water sports, like the boating, yachting, and paddling, which all adventure lovers should explore. The main beauty to look out is during the night time, when the whole surrounding is dark and all the lights from all around the city glows and cast an enchanting reflection in the lake. It feels like the twinkling stars are flooding the valley to reach the zenith of a promised land. Although, every prime city has a Mall Road in it, but the Mall Road of the Nainital is pretty different from others. Unlike the other crowded and busy mall roads people know, this route is also hustling and bustling but with the local shopping stores and the travellers only. The epithet of the route has been changed to Govind Bhalla Panth Margh, but it still holds the appeal, which was earlier with the name, Mall Road. The zoo of the Nainital is set at an altitude of approximately 2200 meters from the sea floor, providing an enriched collection of wildlife species, surviving in their natural habitat. The wild list includes the Leopard, Sambhar, Rose ringed Parakeet, and Silver Pheasants. The list also includes some endangered species, like the Ghoral, White Peacocks, Siberian Tiger, and the Palm civet cat for which the wilderness became the deliverer. 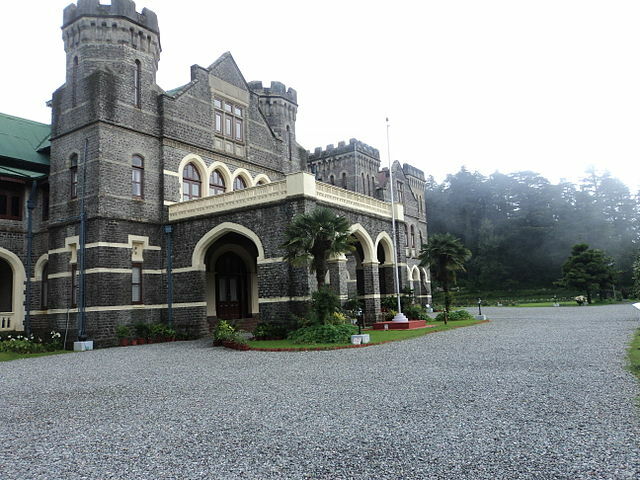 The government body was established in 1899 with the architecture resembling to the Victorian Gothic domestic created by an impeccable architect, F.W Stevens. The Raj Bhawan is the dome for the Governor of Uttarakhand and comprises of 113 rooms, a big garden, a floating pool and a lush green golf court. Holding the two storeys in the mansion, you can explore it by buying a ticket for just 30 rupees. Beautifully inscribed on the Aryapatta hill, the place is located at a walking distance from Nainital. From the summit of the Tiffin Top, you can glare at the crawling Himalayan Range and the neighbouring countryside. As well, at the crest of the hill, the Dorothy Seat is present where you can plan the picnic with families and friend. This perch in this place was lovingly built in the memory of an English lady and a painter by her husband. So, if you are a loving couple then you can revive your love here. Though, if you are a newlywed, then you can exchange love virtues and can promise to remain in love till life. Standing still at an elevation of 7,450 ft, the view point offers an enthralled view of snow covered peaks of all the mountain ranges, like Himalaya, Trishul, Nanda Devi and Nanda Kot. You can click awesome pictures of the snow covered peaks, and can inhale some of the fresh and rejuvenating air, which you will never find in traffic and a kitchen. If you love animal and have soft corner for the endangered wildlife, then the Gurney house can be an aspiration to do something better for them. The house is the private property where the former wildlife activist and author Jim Corbett, once resided. Although, it is a private acquisition, but it is nowadays open for the travellers and visitors as a museum. So, if you are done reading the article and have generated a little spark to plan for the city, then don’t let that spark fade down. The nature’s fine aura and a trail of rejuvenating ecstasy can be witnessed, if visited. So, pack your bags and jump of the comfortable but monotonous life to travel and explore. You can reach here via the airways, trains and buses, but travelling through the connecting terrains is more advisable as you can enjoy the earthy food and culture during the passage.